If space is an issue, a multifunction machine may be ideal for your requirements. Productive, flexible and compact, the multifunction devices we offer are user-friendly, efficient and fast, and can be personalised to suit your exact requirements with a range of downloadable extras. • Productive: 28 to 50 pages per minute. • Efficient: Applications for personalised settings. • Time-saving: (Colour) scan and distribute in a single step. • Professional: Finishers, Super G3/IP fax, IPDS/Postscript®3™ options. • Secure and Flexible: Data protection and handling of various media types. • Quality: Sharp and high-quality colour output with new PxP™ toner. • Productive: Excellent productivity at all print speeds in both colour and B/W. • Quick: Duplexing at simplex speed. 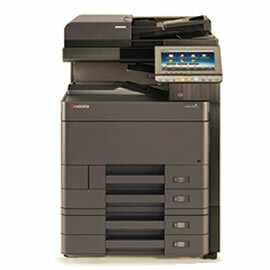 • All-round functionality: Copying, printing, scanning and faxing (optional). • Professional: Unique internal finisher and punch units available.